There’s nothing “false” about Expansion Theory (ET). Universal Stacked Spins (USS) may indeed be the cause of gravity; however, USS conveys absolutely no sense of the resulting mechanics. Actually it makes sense. It’s based on gravity through bombardment. USS causes a 3D vector out from all object, and they are kept from dissolving or expanding by charge bombardment. In the paper I linked There are some calculations about Earth, Moon and humans. ET, on the other hand, completely describes gravity in a way that’s easy to comprehend. It’s the mind boggling mass growth rate that makes ET so difficult to accept. Having achieved that mental hurdle I can now interpret USS as a comforter for those not able to accept ET. Cr6 mentioned mainstream's recognition of the accelerating expansion of the universe last night in the Halton Arp thread. ET may only be apparent. I'll be more than happy to accept USS, I'll need to understand it better first. I’m just pointing out that we need to understand ET whether USS is true or not. I’d like to add that even if USS requires all objects to have a 3D vector out, bphotons should not have it or they would expand like in the ET. Their peculiarity is traveling at c at all times, and perhaps this is linked to the assumption we do that they are the only indivisible particle (no internal forces to act on to expand them). EDIT: I must add something else. I did some research about Saturn, the farther planet of the ones we always knew, and found out that all the survey missions were successful and if Saturn was as big as the table I posted earlier they wouldn’t be. EDIT 2: I’m sorry, in the calculations I used 9.8 m/s^2 for every object, but I saw that it changes for each one. Can you tell me the various numbers or the function, please? In reviewing Ciaolo’s table, I’ve found an error in mine. On Friday 2 March I wrote that in the time it takes for sunlight to reach Pluto, the sun will have expanded 1,360x. Correcting a diameter to a radius doubles that to 2,730 times. My corrected table is above. 1. t0. Change from, t0 = time when light starts, to t0 = time when light leaves the sun. Note this is only a guess based on 2. 2. t1 = time when light reaches Earth. That must mean the light left the sun at t0. 3. r0. Not all numbers shown agree with planetary fact sheet. 4. dist0 = medium distance to Earth at t0. I believe your numbers are incorrect. Referring to the above diagram. It’s a CAD model. The Sun is slightly larger than this period - . The planets – black - (no moons), Mercury through Mars and their concentric orbits about the sun (black) are also included at true scale at their rightmost, or 3 o’clock positions – too small to see. 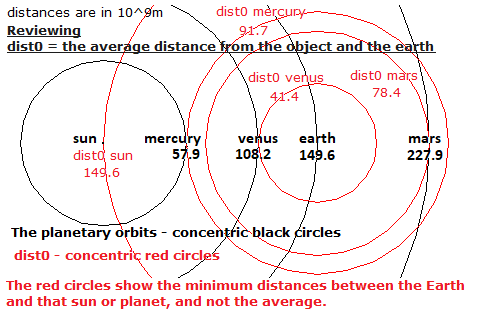 The red dimension lines include numeric values which appear as tiny hyphens, the planets are much smaller. A reminder that the scales involved are incredible. 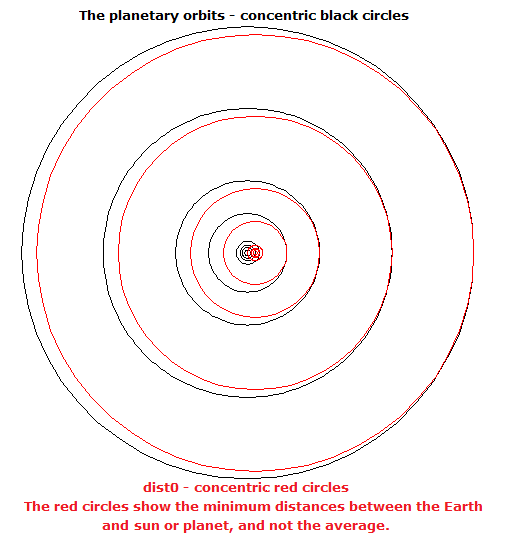 I’ve shown the dist0 - or distance to Earth - numbers as red concentric circles centered on the Earth. The sun’s distance from the Earth always remains the same. The rest of the dist0 numbers appear to be minimum distances – the closest the Earth ever reaches the planets - rather than medium median. The average distance is referred to as the mean, median, or average, but not medium. English is a phunny language. If you do mean minimum, Earth and Venus appear ok, but Mars and Mercury and the rest of the planets still have problems. Please correct me if I’m wrong, I believe the median distances of the Earth to any of the other planets should be equal to that planet’s orbital radius about the sun. 5. Dt equals the dist0 column divided by light speed, so it must have problems. Why does the smallest number belong to the moon? If the light is leaving the sun, the light would arrive at the Earth and moon at roughly the same time. It appears that you are trying to make the Earth the center of Expansion. The sun should be at the center. 6. Dr = calculated expansion of r0. s=(at^2)/2; a = 9.81m/s^2. t is taken from the prior adjacent Dt column. The calculation looks ok, thanks, it pointed to an error of mine. Again, since the expansions you’ve provided are based on distances from the Earth they don’t make sense to me. Expansion must be centered on the sun and not the Earth. I’ll leave the remaining columns without comment. Ciaolo wrote. I’d like to add that even if USS requires all objects to have a 3D vector out, bphotons should not have it or they would expand like in the ET. Their peculiarity is traveling at c at all times, and perhaps this is linked to the assumption we do that they are the only indivisible particle (no internal forces to act on to expand them). Airman. All photons, including bphotons must expand. How can light speed remain the same? Expansion theory is a real brain teaser. Ciaolo wrote. EDIT: I must add something else. I did some research about Saturn, the farther planet of the ones we always knew, and found out that all the survey missions were successful and if Saturn was as big as the table I posted earlier they wouldn’t be. Airman. I have no idea what you're referring too. Ciaolo wrote. EDIT 2: I’m sorry, in the calculations I used 9.8 m/s^2 for every object, but I saw that it changes for each one. Can you tell me the various numbers or the function, please? Airman. As far as I understand it, the universal gravitational acceleration is 9.8m/s^2. The Expansion is constantly accelerating, getting stronger. As objects grow, the gravitational acceleration remains the same but the outward surface velocity of those objects increases. Expansion will continue until the proton’s surface velocity reaches light speed, at which time atomic matter may cease to exist, that is, of course, unless Nevyn’s Spin velocity formula suggests something else. In Universal Spin theory, photons don’t have to expand, but stacked photons and all particles have vectors out (solo gravity part of the Unified Field) together with charge emission. Since solo gravity is an apparent force, Expansion is just a quick, logical explanation of the vector out, but we have it with the USS too. Mathis explained all the relations between the vector out, emission, mass, volume, ambient field and so on, in that paper I linked some posts earlier. Newton gravity is both vector out and charge emissions, we always have them together and we see the combined effect. But there is an exception. We don’t have charge emission from a Bphoton. And we don’t have vector out from a Bphoton. A Bphoton only has c.
My research was about how do we measure planet sizes, and I got to the Voyager and other survey missions. Since my calculations suggest a huge Saturn and sizes of Uranus and Neptune much bigger than the sun, it was obvious that there is no expansion of those planets, or those machines would have had unexpectedly low distances. I remember reading a paper where Mathis said that there is no limit to the Proton expansion speed because (in Expansion theory) since the photon expands, and its speed is still always c, there was no scenario where emission would go slower than expansion. When astronomers calculate sizes, they send radios waves to the planets and measure the time it takes to get back, and then observe the angular size of the planet to calculate the size. r0 = the radius of the object when the light starts from it (not from the Sun). In meters. dist0 = the average distance between the object and the earth. In meters. Dt = Delta time, the time light takes to travel the distance dist0. In seconds. Dr = the distance traveled by accelerating at 9.81 m/s^2 for Delta time seconds. In meters. r1 = the radius of the object that, starting at r0, expanded of Dr. In meters. This represents the real size of an object that was “pinged” with radio waves to calculate the distance from it, and was then observed using a telescope that could only see its image how it was Dt seconds earlier. Dr% = the ratio between the distance Dr and the observed r0. Ciaolo wrote. In Universal Spin theory, photons don’t have to expand. Airman. Agreed. I believe photons must expand In Expansion theory. Ciaolo wrote. My research was about how do we measure planet sizes, and I got to the Voyager and other survey missions. Since my calculations suggest a huge Saturn and sizes of Uranus and Neptune much bigger than the sun, it was obvious that there is no expansion of those planets, or those machines would have had unexpectedly low distances. Airman. Thanks for trying to explain, I still don't understand. Even given Expansion theory, how can the Jovians possibly be bigger than the sun? Ciaolo wrote. I remember reading a paper where Mathis said that there is no limit to the Proton expansion speed because (in Expansion theory) since the photon expands, and its speed is still always c, there was no scenario where emission would go slower than expansion. Airman. I don't remember that. On the contrary, I remember Miles performing a calculation of the age of the universe based on the proton surface velocity. Proceeding to the table review, I see the dist0 numbers are better. The image above shows the planetary orbits out to Neptune. All the dist0 numbers now align with the sun or planets. The diagram above only shows the Sun through Mars for the most clarity and ease of discussion. The corrections you’ve made to the distances are readily apparent. Please note that the Earth and all the planets are at the 3 o’clock positions, at which time all the numbers shown are correct. Try this exercise, with the Earth at 3 o’clock, pick any random point for any other planet somewhere in its orbit. You will see that that distance will exceed the dist0 value you’ve given. 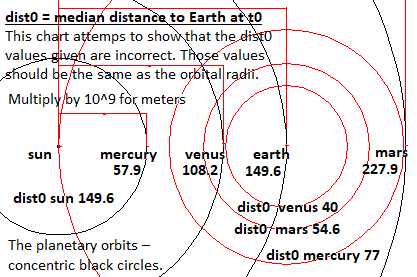 The dist0 numbers are therefore the minimum distances from the object and the earth, not the average distances. Ciaolo wrote: My research was about how do we measure planet sizes, and I got to the Voyager and other survey missions. Since my calculations suggest a huge Saturn and sizes of Uranus and Neptune much bigger than the sun, it was obvious that there is no expansion of those planets, or those machines would have had unexpectedly low distances. This reasoning is faulty. You are looking at expansion as if it existed on its own and then suggesting that expansion doesn't exist because we don't find big planets or that the distances to them are too large for expansion to be occurring. What you are forgetting is that you are actually talking about orbits, not just radii and distances. Expansion is only one part of an orbit with the other being charge repulsion. That repulsion is pushing the planets back outwards as everything expands so that the relative distances are kept the same. Another important thing to consider is that the actual meter has also expanded. Or I should say that what we use to determine what a meter is has expanded, which ends up in the same place. Everyone falls into the same trap when thinking about expansion. They try to make things expand without themselves expanding. That is, you must always recognize that you are part of the model. Any device you use to measure is part of the model. We can only work from within, never from the outside. When we take time into account, expansion and time are related. Nevyn is correct, everything – including us - is expanding. My revised table is below. Column G – Expansion, applies to everything. Column F shows the Expanded Sun radius for reference, one can make a column for a given planet using the same col G multiplier. Unless I’m mistaken (what? ), in the time it takes for sunlight to reach Neptune (15,000 sec), the solar system (and everything inside and out) will have expanded 1,580x. I would like to figure out how to make a spiral orbit model, where in a single Earth year, a single spiral if you would, everything expands 7*10^9x. As usual, comments are welcome. 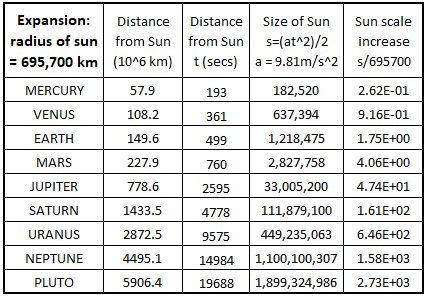 Table showing how quickly the solar system expands, given Expansion theory. Airman. I agree, all the planets are larger than we think; however, I do not believe your calculations are correct. I can’t say how they are wrong since I’m still trying to figure out the problem. When we see the planet we are seeing it as it existed sometime in the past – from the time it took the light to get here – not as it is now, that light speed time delay is well understood. Expansion theory adds the fact that all objects are expanding at 9.81m/sec^2. Observers must also see slightly differing expansion rates due to differing locations in time and space. We know that light speed (such as radio waves) is not the same as the expansion rate, and so all celestial (large or small) observations or measurements require an expansion correction. I think the planetary data may indeed need corrections. In order to solve for the actual planetary radius, we need a common time to tie that planet to the Earth. Above, I recommended you read “The Perihelion Precession of Mercury” in order to get a feel for the thinking involved. I believe we need to include the Sun in order to compare Earth and any of the other planets. If you already understand all that, please help. Observers must also see slightly differing expansion rates due to differing locations in time and space. What if this is why the orbits are thought to be elliptic when actually they are circular? Airman, column B in your table isn’t the real object size, it’s the result of the calculation process based on the radio waves and the angular size, as measured from Earth. Both for Mercury and Venus, and for the outer planets, we should start with real observations and measurements, not from the calculated size, like Mathis did in the precession of Mercury paper. Only in the sense that expansion happens in time, but then so does everything else because time is a measurement of change. The mainstream calculations are making a few assumptions that need to be validated when looking at it from an expansion perspective. They are using time to make measurements but to do so, you must assume the constancy of the speed of light. The speed of light is a velocity so they are also assuming the constancy of the distance. They can do that because they are not using expansion. However, to look at it through expansion then you must admit that the distances are not constant. The relative distances are constant, but the real distances are not. So, relative to us and everything else in the universe, the speed of light is a constant but from a non-expanding perspective it is most definitely not. In fact, from an expansion perspective, it isn't even a velocity, it's an acceleration. Things change under expansion. Basic things. Nothing can be taken for granted and must be re-evaluated to make sure that we understand the tools that we are using. It is difficult and confusing and time consuming but it will help you more than you can imagine with all Physics work because it forces you to look closely at the little things and get a better understanding of what they are and how they operate. So keep looking into this and any other problems you can find and keep challenging your own assumptions. Every time you come across some value, stop and think about how that value has been measured and how expansion effects that measurement. None of this means that expansion is real. Only that if you want to look at things from such a perspective, then you have to get down'n'dirty and make sure that you are applying expansion at every step that it must be applied. Airman. On the 28 of Feb I mentioned reading Explaining the Ellipse. As I said, I didn’t see Miles mention expansion directly; nevertheless, your idea that the varying expansion rates we observe somehow creates the appearance of elliptical orbits certainly seems possible to me. I agree, any planet radii determined by the method you indicated - radar return time delays and optical angular measurements - will not include the planet expansion that occurs during the time it took for the planet’s light to reach us – the now. The Sun and all the planets are actually bigger than we think, and column B needs expansion corrections. For example, if we were to visit Mars, we would see that the planet is actually larger than indicated in the Planetary fact Sheet. I read “The Perihelion Precession of Mercury” once again. Though much of it seems beyond me, expansion theory itself is certainly straightforward. It is the inverse of curved space, making relativity easy to understand. I know the reader is not surprised at this point, I came up with another solar expansion table. This time, I calculated the surface gravity of the Sun and each of the planets separately. The radius doubling time, 19 minutes, must be the same for all bodies; but each body’s radius is different, therefore each body's acceleration due to gravity must be different. Now the sun has expanded only 173.85x in the time it took sunlight to reach Neptune. I feel better about these numbers because now I see the Sun's radius doubles between the Mars and Jupiter orbits, where I should have expected to see it. Of course, I see that my calculated 19min radius doubling gravity values do not agree with the planetary data gravity values. The data says the Sun's gravity is 274 m/s^2, I believe it must be 1071.24 m/s^2. Using the gravity from the data sheet (274m/s^2), the body will not double its radius in 19minutes. Using my calculated gravity accelerations, and the dist0 minimum distances, the radius correction numbers are much smaller than I expected. I'll need to look at it more before sharing. Nevyn, thanks for the additional insight. I may be testing yours and everyone else's patience, but I'm certainly enjoying the review.